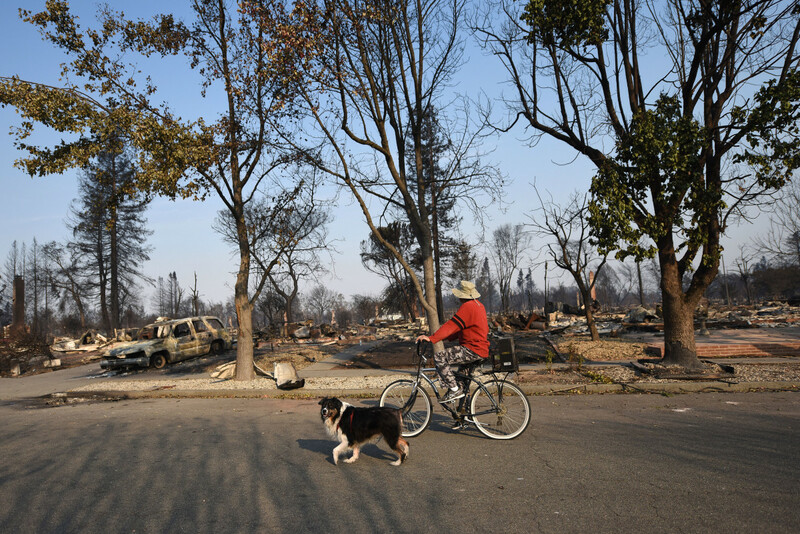 A man rides his bike through a neighborhood destroyed by wildfire in Santa Rosa, California, on October 11th, 2017. With firefighters finally gaining control of blazes across Northern California, the scope of the devastation caused by the disasters has started to emerge: As of Tuesday, the fires have killed 42 people and destroyed at least 8,400 buildings. That makes them, by far, the deadliest series in state history. Unfortunately, they could also be a sign of what&apos;s to come. 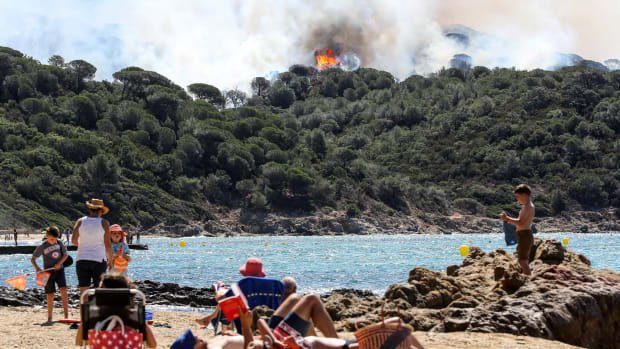 Climate change and population growth make highly destructive fires like these likely to become more common in the future. Pacific Standard spoke with three California residents, all of whom have interesting, well-supported, yet often little-known ideas for wildfire prevention strategies that go a bit deeper than tree removal. 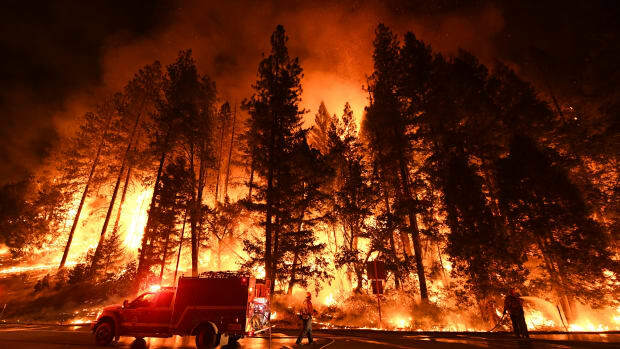 It remains to be seen whether their proposed policies are politically and financially feasible, but, in the meantime, the ideas reveal overlooked reasons why the West&apos;s wildfires are worsening, and what we can do about it. People need to start thinking of wildfires the way they do tornadoes and earthquakes, says Max Moritz: as inevitable natural disasters. That means spending more time and money on getting governments to build with more foresight on fire-prone land, and on convincing homeowners to retrofit their houses to be more fire-proof. Both Congress and the public often focus on preventing fires, or taking steps to reduce their severity, Moritz says. While important, that ignores the reality for many parts of the state. "We can no more prevent fires on these landscapes that have been burning naturally for thousands of years than we can prevent earthquakes," says Moritz, a fire-risk researcher with the University of California system. Before extensive human settlement, many areas of California naturally burned every several years to several decades, depending on the ecosystem. Fire was so regular that some native plants evolved so that they won&apos;t germinate until their seeds are bathed by fire. "We can, as a society, take steps to make sure that the exposure and the damage that gets caused by fires like this is less," Mortiz says. "The idea that we can somehow keep fire from happening is unrealistic, and I think the sooner we get past that idea, the sooner we can start looking at real, comprehensive solutions." Last year, Mortiz and historian Scott Gabriel Knowles published an article in American Scientist that suggested rethinking evacuation policies, encouraging homeowners to retrofit to reflect the latest science about how houses ignite during wildfires, and discouraging developers from building in especially fire-prone areas. A fireman puts out a fire at a home in the Anaheim Hills neighborhood in Anaheim, California, on October 9th, 2017. Often most at-risk places lie in what scientists call the wildland-urban interface. These are suburban neighborhoods near grasslands or woods in which wildfires often start. During a blaze, embers from the burning forest may be carried over a mile to wildland-urban interface homes, igniting them. That&apos;s thought to have happened in Santa Rosa, a town devastated by the Tubbs Fire, the Los Angeles Times reports. California has actually made better progress on these fronts than many states. Steve Quarles, a fire scientist based in South Carolina, tells Pacific Standard that California is the "leader of the pack" on wildfire policy. In 2007, California officials released a map that designated places as moderate to very high risk for fire. New buildings have to meet stricter anti-fire codes if they&apos;re in higher risk areas. But the laws don&apos;t apply to older houses that already exist. In addition, in the wake of the Northern California fires, scientists are worried California&apos;s fire-hazard map may be out of date. 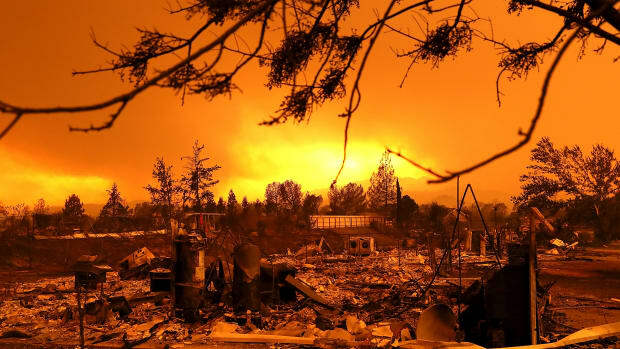 The Los Angeles Times found one suburb of Santa Rosa that was not designated as high fire risk—although newer research would have labeled it so—and thus was exempt from ignition-proof building codes. The suburb was razed by the Tubbs Fire. 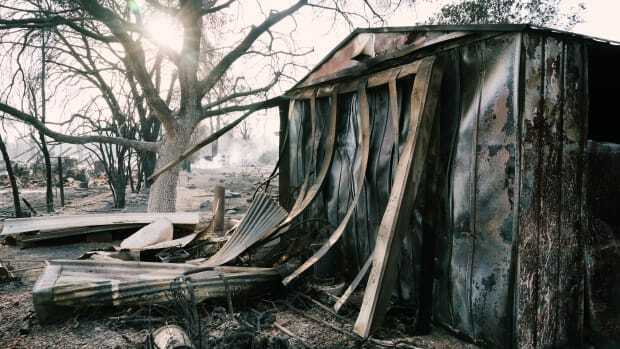 State agencies are working on re-mapping and will be looking at lessons from the Tubbs Fire, Dave Sapsis, a scientist working on the re-mapping, told the Times. In 2002, Virginia Moran bought a wooden A-frame cabin atop a long, narrow canyon, with a view of the Salton Sea. In the fall and winter, fierce winds hurtled down the canyon. Sometimes Bureau of Land Management officers would come by, she says. She&apos;d make them coffee and they would joke if there ever were a wildfire in the state park below, they could stand on her deck to watch it. Moran writes novels, and the house played into her fantasy of having "a place to write on the edge of the universe." She spent $30,000 remodeling in 2003. In October of that year, the Cedar Fire tore through San Diego County, incinerating thousands of homes, including Moran&apos;s, and killing 15 people. "I moved to the most insanely stupid place for fire. The house was literally a box of matches," she says. After Moran&apos;s cabin burned down, she set off on a quixotic mission. She wanted the City of San Diego to buy her land from her—maybe the city could set up a trust for this purpose?—and keep anyone from ever building on it again. It didn&apos;t work; there&apos;s since been another home built on the property. "I can&apos;t go down there anymore because it upsets me so much," she says. "There&apos;s a house there and it&apos;s going to burn." 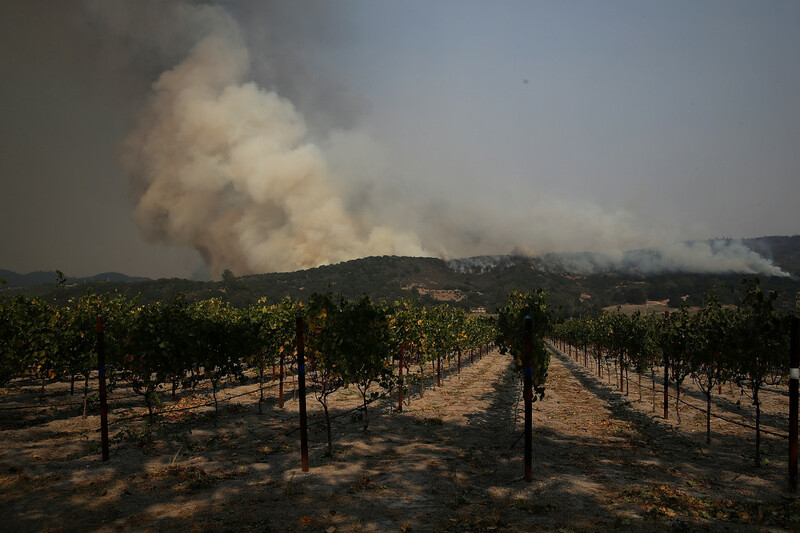 A wildfire approaches Gundlach Bundschu winery on October 9th, 2017, in Sonoma, California. Moritz, for his part, might agree that governments could take a stricter stand on where people may build. "I don&apos;t think it&apos;s my role, as a scientist, to say there should be an outright ban on that, but I think it&apos;s my responsibility to point out that we haven&apos;t addressed that question," he says. "With landslides and floods, we actually restrict building. With fire, we don&apos;t tend to look at it like that." Rick Halsey is a longtime southern Californian: His family grew flowers in the coastal town of Goleta from the 1950s until the 1990s. But it wasn&apos;t until he was an adult, teaching high school biology in San Diego, that he first began really learning about the region&apos;s natural ecosystem, a dry, scrubby landscape called chaparral. As he learned, he fell in love. Eventually, he quit his job and founded the California Chaparral Institute to be "the voice of the chaparral," as its website says. 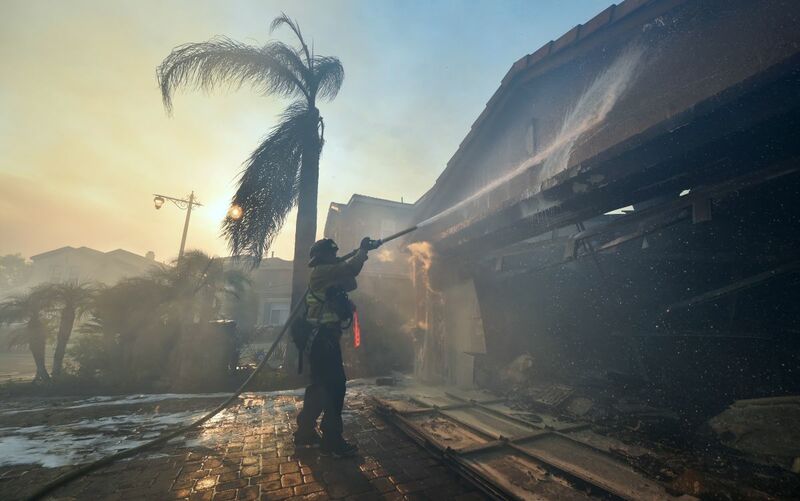 He advocates for shifting the focus of southern California&apos;s fire-prevention strategy away from clearing brush, toward house- and community-based tactics like those Moritz espouses. Clearing chaparral can actually make the land more flammable, Halsey argues, because it encourages non-native grasses to grow. Halsey&apos;s stance is supported by some research that suggests decades of shrub-clearing hasn&apos;t helped prevent fires in southern California. 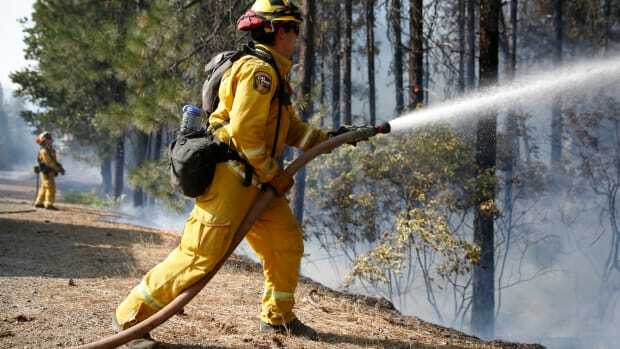 Experienced firefighters, however, say that clearing land is indeed effective. Halsey thinks the issue is confused by the fact that forest thinning has been shown to make destructive fires less likely in Northern California, but, he argues, the situation in the south is different. 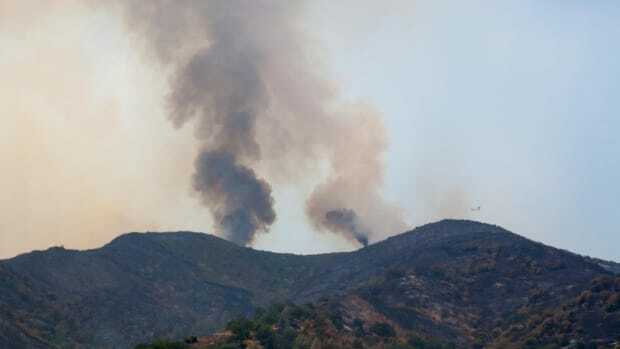 Helge Eng, deputy director of resource management at the state agency Cal Fire, says the state&apos;s latest plan for managing vegetation takes into account comments from Halsey and researchers who argue against removing too much chaparral. Halsey himself lives in a fire-prone area, in a 100-year-old house—that is, one that&apos;s far older than wildfire code. "It&apos;s pretty much a tinderbox. I&apos;ve done what I can," he says, pointing to retrofits like putting screens over vents on the house. "Fundamentally, I think, we all need to take a deep breath, look in the mirror, and figure out what our position is in the natural environment and what we can and can&apos;t control." Wildfires in the state are getting bigger and more costly.